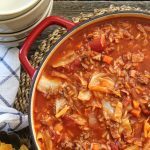 This Cabbage Roll Soup is a hearty, healthy and delicious dinner…and it tastes just like cabbage rolls! Ready in 1 hour! Well here in Alberta it turned from summer into fall overnight. One minute the air smelled like sunshine and lazy days, and the next it was all fall leaves and routine, but honestly I’m ready for it. We had an amazing and busy summer, but now I am craving routine, sweaters, brown nail polish, shoes with socks, all things pumpkin, and fall comfort food. I’m also finding myself in a nesting mode of sorts. I think it’s due to back to school jitters and the fact that I now have two kids in junior high, and I’ve been worried about the transition to a new school and all the stuff that comes with teenagers. Le sigh. So I cook and bake to calm my worries. 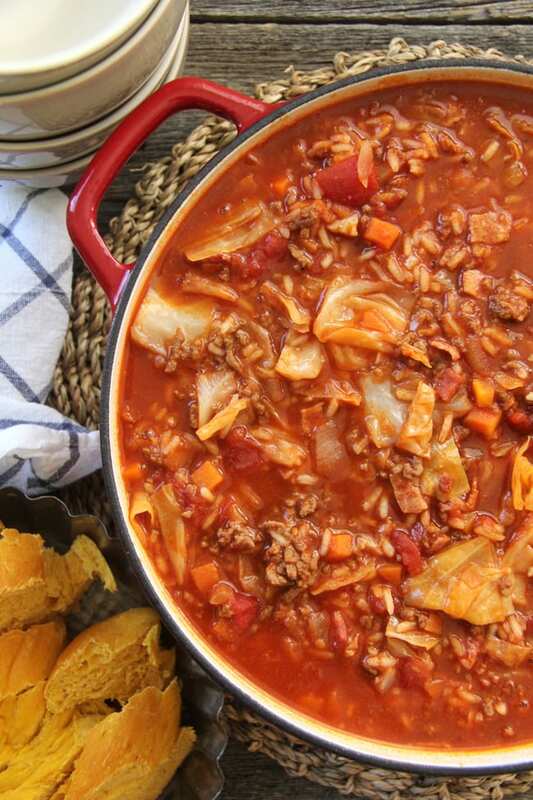 Last week I made zucchini loaves, chocolate zucchini cake, monster cookies, chocolate chip cookies, bran muffins, hamburger soup and this cabbage roll soup. See what I mean? Nesting. But at least the freezer is stocked. Anyway, I’ve been wanting to make a cabbage roll soup for so long, and I finally made one, and I have to say this soup is delicious! It tastes just like a cabbage roll, but without all the fuss of having to roll them in cabbage. I think one of my most favourite things about this soup is the fact that is has a little bacon in it, which adds such a nice smoky flavour to the tomato base. 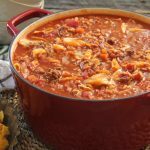 That and the fact that it’s loaded with delicious ingredients…ground beef, tomatoes, cabbage, carrots, onions, garlic, bacon…mmmmm, all the makings of cabbage rolls. 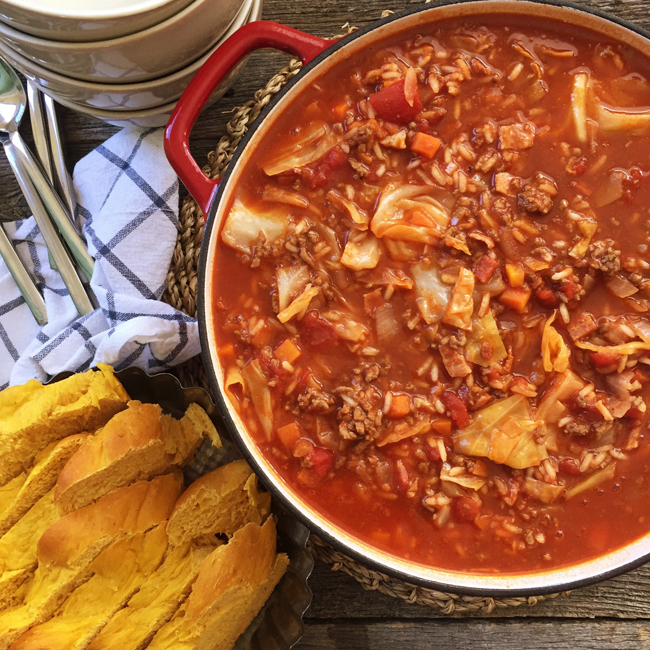 I served our cabbage roll soup with a homemade braided pumpkin bread. A perfect fall dinner, and comfort food for stressful days. In a stock (soup) pot, brown the ground beef with the onions, garlic and carrots. When the beef is cooked, drain any excess grease. Return the pot to low-medium heat, and add the chopped cooked bacon. Cook for about 1 minute. Add the chopped cabbage and cook for about 2 minutes more. Add the remaining ingredients: consomme, diced tomatoes, tomato paste, tomato sauce, water, worcestershire sauce, bay leaves, sugar, rice and salt & pepper. Simmer for 35 – 40 minutes (or until the rice is tender). This soup will thicken over time, so you may want to add more water or a water/consomme mix. 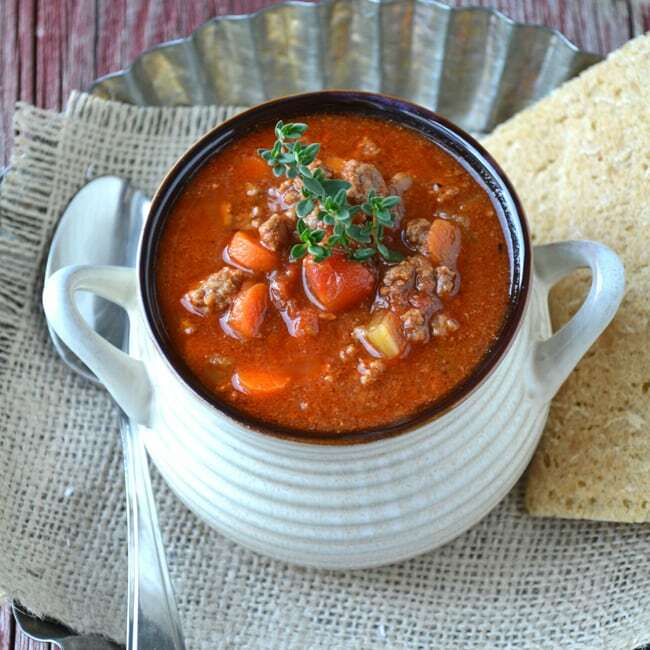 I hope you try this soup and love it too! Want more soups? Here are more great recipes! 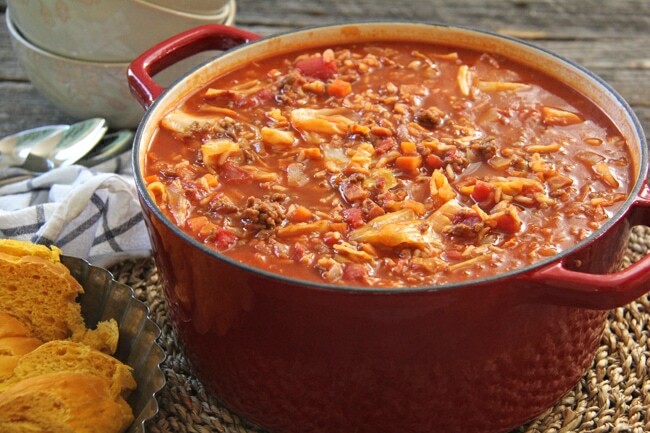 Looks very good…I often make lazy man cabbage rolls (the shredded cabbage instead of rolling lol) because of the amount of shredded cabbage my work place tosses out (most mondays) ..I’ll have to give this one a try soon!! Oh I LOVE lazy cabbage rolls! 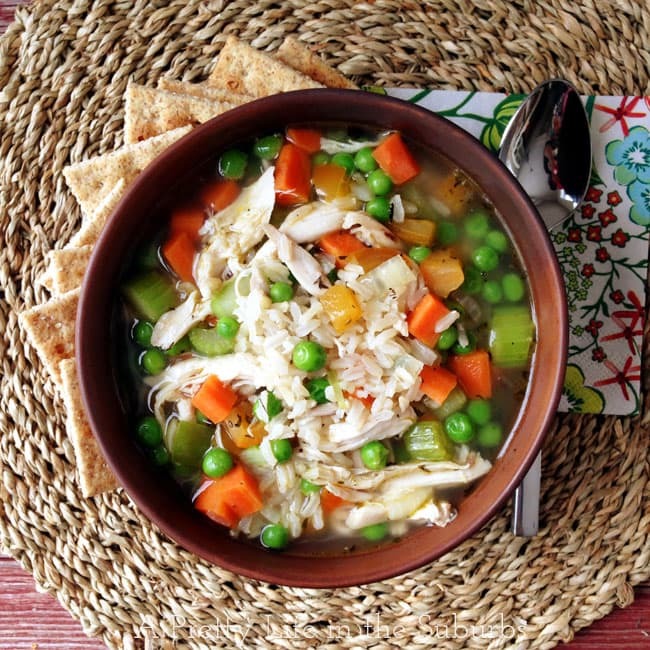 If you like those you’ll definitely like this soup! I can’t wait to make this tonight! Do you add cooked or uncooked rice? Hi! You add uncooked rice…it will cook while the soup simmers. I hope you love it!! Can you sub low sodium beef broth for the consume??? Wow! You are Johnny on the spot with responses. Appreciated, thanks!! No problem at all! I hope you like the recipe! If you leave out the rice would you use a little less liquid? I would probably leave out about 1 cup of water…but you may not need to. This soup thickens quickly. Made this today, and we just enjoyed this for dinner! Everyone loved it. 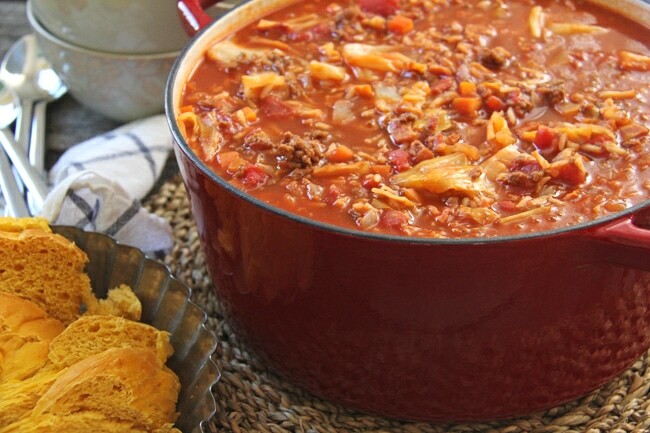 Great hearty soup for a cold January day in Cleveland! Do you think I could turn my left over cabbage rolls into this soup? Have left over cabbage rolls and hate to throw them away. 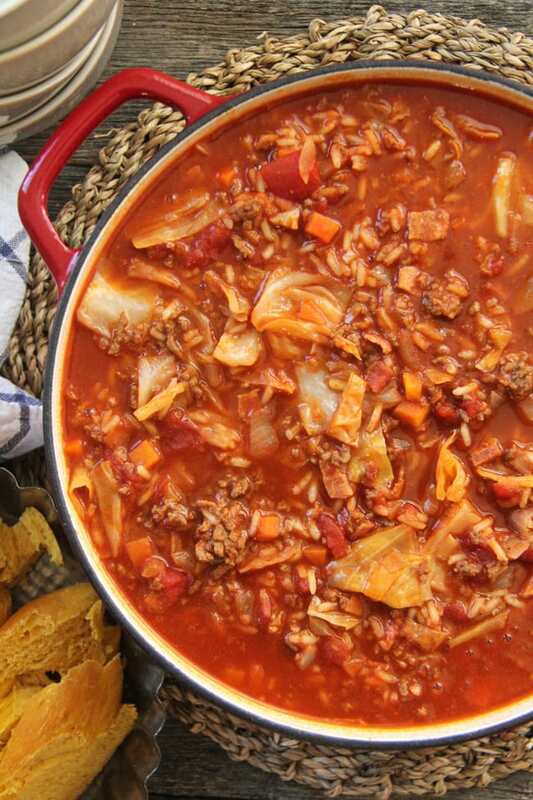 This soup looks and sounds amazing and wondered if I could repurpose my cabbage rolls into the soup??? Any ideas or suggestions would be appreciated. Thank you. 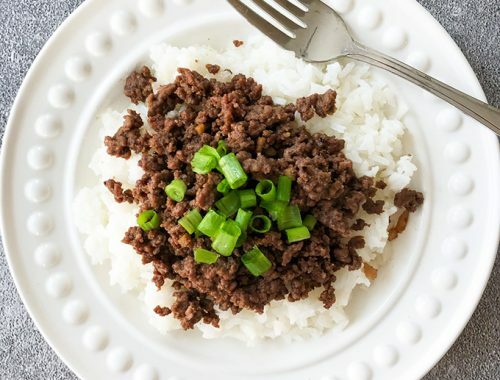 Can you use medium grain rice? Hi Seterria! Yes, you definitely can! I make this soup but polish style. I make little meatballs and I add Brown sugar, white sugar, and lemon juice to make it sweet and sour. It delicious. Oh that sounds delicious! 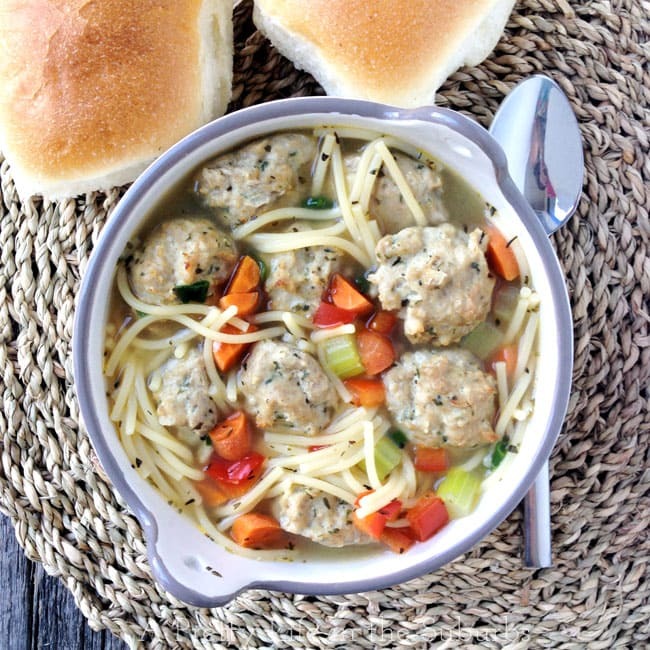 I love the idea of adding meatballs! I make what I call mock halupki, never thought about a soup. Looking for recipe for stuffed pepper soup. Had it in. Restaurant once, delicious! This soup was a huge hit at our bible study the other night. Thank you for sharing it. My question is this serves 8 but how much cup wise is each serving? Thanks. I’m so happy you liked it Charlene! Really good soup! So glad I tried it. I’m so happy you enjoyed it Erin! I want to make this for supper tonight but don’t have any beef consommé! Will it be okay to just use beef broth? I read that beef consommé is thick and solid at room temperature. Do I need to do anything like add cornstarch to thicken the broth? Thank You! Hi Sonia! Yes you can absolutely use beef broth instead. Consomme is a little thicker, but it’s not a problem to use beef broth instead, and you won’t need to add any cornstarch. Enjoy! Do I use cooked rice ? Hi Stephanie! No, use uncooked rice for this recipe. Enjoy! 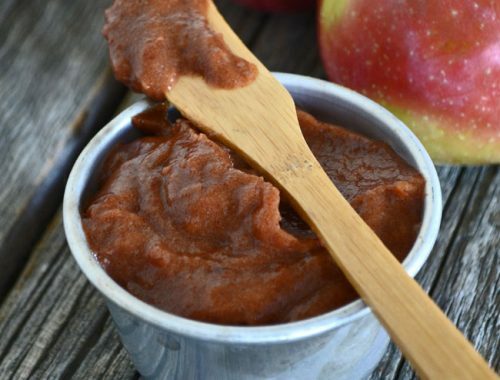 Can this be cooked in slow cooker? This makes me so happy! I’m thrilled you enjoyed it Shirley! This looks delicious! Can this be done in the slow cooker, adding cooked rice at the end? Ok thank you for getting back to me. I think I will make it and we can just reheat it when we get home again. This soup is delicious; I did not use the bacon and I didn’t add the rice and it was still absolutely delicious. I will be making this again. . Excellent! I’m so happy you enjoyed it! I’ve been searching for a cabbage roll soup for over an hour. Each one seemed to lack the rich taste I’m looking for. Then, boom! I came across yours. It has every ingredient I would want to put in the soup and I am making it tomorrow! I love that! I hope you enjoy it! Does the tomatoe mellow with cooking ? Hi Sue! Yes the tomato cooks down quite a bit, it’s definitely not an overly tomato flavoured soup. I hope you enjoyed it! This is fabulous. I make many variations of this dish and like to try new recipes of this type of dish when I see them. This ranks among the best. We loved it. I think it yields more than 8, but that’s good for us!! I followed recipe as is except didn’t use rice, used beef broth, and for the tomato sauce, I used a 28 oz can of tomato puree. I also used 1/2 ground turkey, 1/2 ground beef. Thank you so much for this wonderful recipe. You are so welcome Debi, I’m so happy you enjoyed it! I love to see how others tailor the recipe…that’s what makes it so great! I liked all the positive feedback so I think l’ll make this this weekend! I LOVE soup and love trying new recipes. One of my favorite things to make and share with my friends. Will pick up some Worcestershire sauce tomorrow. Used the last of mine on some stuffed peppers yesterday! So GOOD! I even posted a video.Great feedback from the family. Was not a disappointment for sure!